America's Oldest Speed Shop®. Sparco 0011273 Energy RS-5 BC Racing Suit, Black/S, 48. This is garage sale priced because it has been discontinued. The Sparco Energy RS-5 BC is an all-new suit for 2017. The Energy RS-5 BC is a lightweight three-layer suit which offers superior fire protection, breathability and comfort. The Energy RS-5 BC is made from fabrics which offer an excellent compromise between weight and breathability. Tone on tone stitching combined with world-famous Sparco Signature epaulettes and boot cut pant legs give the Energy RS-5 BC an attractive and modern design. The Energy RS-5 BC features full floating arm sleeves with ultra-soft knit cuffs. Pre-curved arms and legs along with multiple stretch panels provide ultimate comfort in the driving position. The Energy RS-5 is available in 2 colorways in sizes 48-66. Multiple stretch panels for comfort. 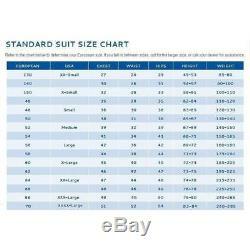 Sparco Fire Suit Sizing Chart. Please pay for all items at the same time. We cannot combine your order if you have already paid. Speedway Motors is Americas Oldest Speed Shop® and has been a trusted source for specialty rodding and racing products and friendly expert advice for more than 66 years. Repack the item in a sturdy box, include a copy of your invoice and complete the form on the back of the invoice. All exchanges need to have reshipping charges included. Speedway accepts full responsibility for the accuracy of our listings and product representation. 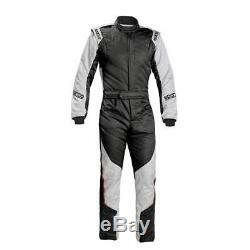 The item "Sparco Racing Suit Energy RS-5 Three Layer 1-Piece SFI-5 and FIA 2000 Rated" is in sale since Friday, February 16, 2018. This item is in the category "eBay Motors\Parts & Accessories\Performance & Racing Parts\Safety Equipment\Suits". The seller is "speedway_motors" and is located in Lincoln, Nebraska. This item can be shipped to United States, Canada, United Kingdom, Denmark, Romania, Slovakia, Bulgaria, Czech republic, Finland, Hungary, Latvia, Lithuania, Malta, Estonia, Australia, Greece, Portugal, Cyprus, Slovenia, Japan, China, Sweden, South Korea, Indonesia, Taiwan, South africa, Thailand, Belgium, France, Hong Kong, Ireland, Netherlands, Poland, Spain, Italy, Germany, Austria, Israel, Mexico, New Zealand, Philippines, Singapore, Switzerland, Norway, Saudi arabia, Ukraine, United arab emirates, Qatar, Kuwait, Bahrain, Croatia, Malaysia, Brazil, Chile, Colombia, Costa rica, Panama, Trinidad and tobago, Guatemala, Honduras, Jamaica, Antigua and barbuda, Aruba, Belize, Dominica, Grenada, Saint kitts and nevis, Saint lucia, Montserrat, Turks and caicos islands, Barbados, Bangladesh, Bermuda, Brunei darussalam, Bolivia, Ecuador, Egypt, French guiana, Guernsey, Gibraltar, Guadeloupe, Iceland, Jersey, Jordan, Cambodia, Cayman islands, Liechtenstein, Sri lanka, Luxembourg, Monaco, Macao, Martinique, Maldives, Nicaragua, Oman, Peru, Pakistan, Paraguay, Reunion.